Over the past twelve months I’ve personally trained around 750 marketers from all kinds of industries and all types of teams, and I can tell you without hesitation that we’re trying to do too much. Here’s how I know: I keep hearing the same things over and over again. These are all symptoms of being overextended, of trying to do too much at once. You might know it as multitasking, but it’s real name is context switching and it’s making us all crazy (and very unproductive). Recent data backs me on up on this, revealing (among other things) that marketers find it challenging to get stuff done because of interruptions, and that we feel powerless to stay no to projects even when we know they aren’t important. This annoys us for sure, but it also contributes to burnout, a nefarious force in knowledge work that saps productivity and drains companies dry like a multitasking vampire. Fortunately, a proper Agile marketing implementation combats the context switching monster, lets us tell people “no” (or “not right now” if you need to be diplomatic), and provides our bosses with a stronger bottom line. Multitasking, or context switching, is the bane of marketers, who already have a problem trying to hold their customers’ attention. Having a lot of tasks to do on your plate is one of the biggest culprits responsible for lost productivity. Increasing backlog adds to marketers’ frustration and inability to deliver on time. Agile marketing solves marketers’ workflow problems and gives them a measurable way to focus on outcomes. First off let’s get our terminology straight. Many of us like to say we multitask, or simultaneously do more than one thing. But the harsh truth is none of us can really do that. 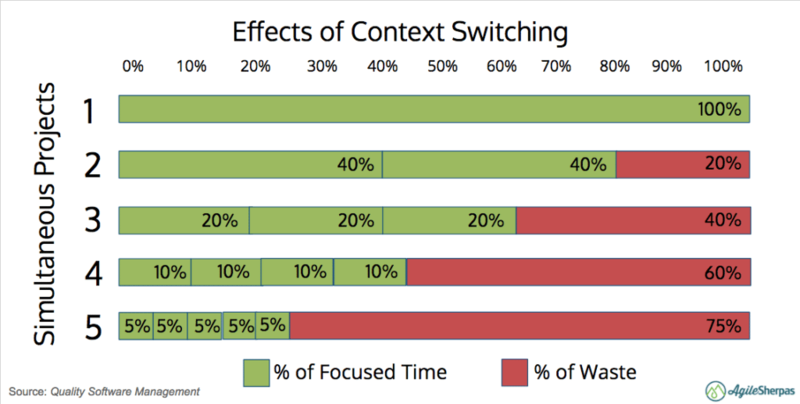 Well, like 2 percent of us can (psychology professor Dave Strayer calls them “supertaskers”), but the rest of us are really just switching back and forth between tasks, also known as context switching. The problem is we all think we’re part of the supertasking cohort. If you think that, go take this test right now. If you’re a supertasker, awesome. Feel free to skip ahead. If not, keep going, my fellow monotasker. We’re worse at all of the tasks. We lose a whole bunch of time to the act of switching. What it tells us is the more additional tasks we add, the more time we’re wasting. See that scary part on the bottom? It says if you’re moving back and forth among five things, you only have 5% of your productive time to devote to each thing. The remaining 75% of your time is wasted. You’ve probably guessed where I’m going with this, but marketers are pretty darn bad at preventing this kind of waste from destroying our days. 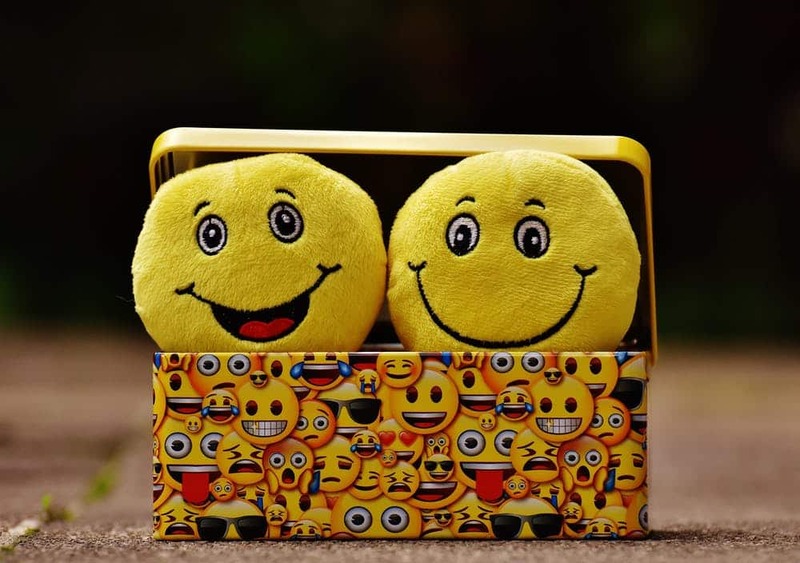 The 2019 Marketing Happiness Report from MarketingProfs found that a shocking 73% of marketers find it difficult to complete tasks because of interruptions at least sometimes. When we’re interrupted, we have to spend a huge amount of time and mental energy trying to get back to what we were doing. This means that our original task takes longer than it should have. The interrupt-driven task also suffers, because it’s competing with our first task for our brain’s attention. We’re psychologically hard-wired to finish things, so if we leave a task undone our brains can’t let it go. Our focus will remain split until we’re able to check that item off our to-do list. You sit down to write a blog post, but *ping* somebody has a quick question on Slack. So you try to be a good colleague and answer it, but you’ve got to hunt down a document to do so. Ten minutes later you’re about to resume the post when your boss drops by your desk and asks you to join her for a quick meeting. It feels a lot more like a demand than a request, so you grab your computer and sit down for an hour-long snooze fest you didn’t really need to be involved in at all. Ok, back at the desk. You’ve gotta document that one action item you were given at the end of the meeting, so you open up your task management app and throw it on to your massive list of stuff you’re responsible for. The app is full of red dots telling you things are overdue, so you spend ten minutes agonizing over whether to keep working on the blog, or fill out the expense report from last week’s conference, or do those edits on your teammate’s new white paper he asked you for like three weeks ago, or *ping* join the webinar you signed up for that’s starting in five minutes. If this is happening to every single person in a marketing department, it’s no wonder that everything takes so long to get done. The way we fix this is by limiting our WIP, or work in progress, very strictly. It’s really not that complicated: if we cut the number of items we have in progress in half, we’ll get them done twice as fast. Put another way, if we do 10 things simultaneously and it takes us two weeks to finish them all, we could get them all done in one week simply by working on five until they’re finished and then moving on to the next five. Study after study bears this out. 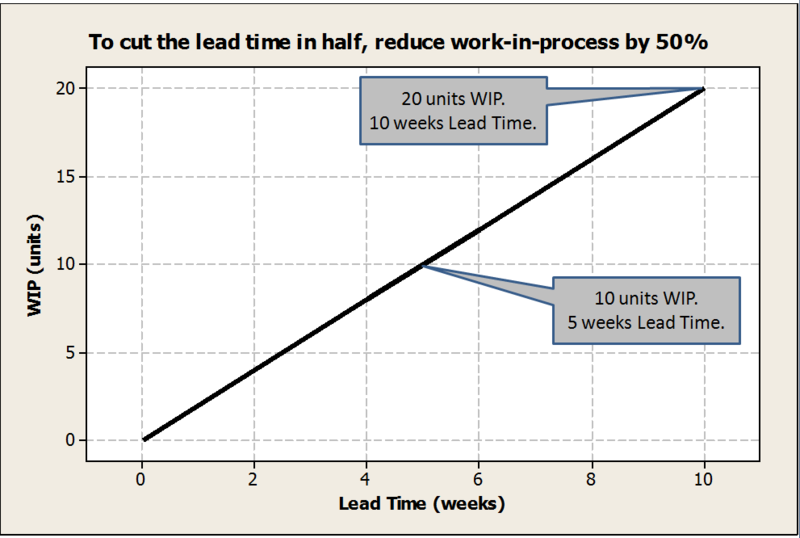 Lead time (the time between initiating and completing a process) is cut in half if we reduce WIP by half. This applies to individuals as well as teams. So while you’ll get the most benefit from adopting it across your entire marketing team, individuals can greatly increase their output (and quality of life) by limiting their own WIP. I have a strict WIP of two on my own personal kanban board, and it’s pretty much the only thing that keeps me from spinning out of control. People, this is not OK.
Forty-one percent of us only say no to irrelevant projects a few times per year?!? Twenty-six percent don’t have the autonomy to say no at all?!? I’ll let Tina convey my horror. Ok, deep breath. I’m better now. 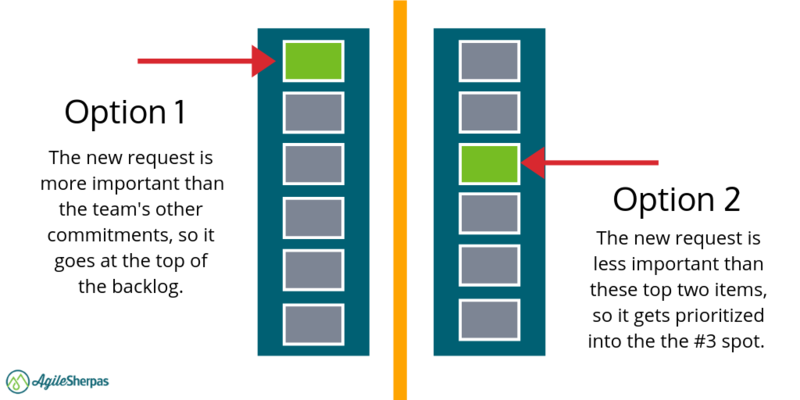 Again, Agile practices offer a solution. Instead of saying “yes” to everything and adding it instantly to your never ending pile of work in progress, you can say “yes” and put it into your backlog. Now, I realize “backlog” can be kind of a loaded term. For some people it implies a place where extraneous stuff goes to be ignored until it goes away. But in Agile the backlog is the strictly prioritized list of upcoming work. So when a new request comes in we compare its importance to the list of stuff we’ve already agreed to do and see where it falls. Maybe it’s legit important, and we put it at the top of the backlog (as you see on the left). Whenever our WIP limits allow, it’ll be the first thing we tackle. If it’s only important to the requester and not really to the business, it might fall quite a bit lower (as you see on the right). We’re not saying we won’t ever do it, we’re just saying it’s objectively not as crucial as some of our other commitments. And remember, by not starting on it right away we’re actually going to finish it sooner because we’ll have less work in progress, reduce our context switching costs, and lower our lead times. So call it a backlog, call it a to-do list, call it a fluffy kitty corral — I don’t care. Just use it to protect your time so you can be a better marketer (and a happier person). I’m a career marketer, so I’ll admit to being biased in favor of practices that make marketers’ lives easier. But the truth is that limiting work in progress and prioritizing effectively isn’t just good for us, it’s good for the places we work too. Gallup recently reported that 23% of employees feel burned out at work often or always, and another 44% feel burned out sometimes. Employees who feel this way are 63% more likely to take a sick day, and 2.6 times as likely to be actively seeking a different job. So executives — here’s your executive summary: let your marketers limit their WIP and say no to stuff, and you’ll immediately start to see the results. So yes, we marketers have a lot of demands on our time. Marketing is important, so lots of people both inside and outside our organizations bombard us with high expectations. We can meet and exceed those expectations under the right circumstances — I know because I’ve seen it happen. Now grab some scalable Agile practices and create a system that lets you do more by doing less. The post The Happiness Factor: How Agile Marketing Combats Burnout and Delivers Better Outcomes appeared first on AgileSherpas.com.